Tired of mowing? 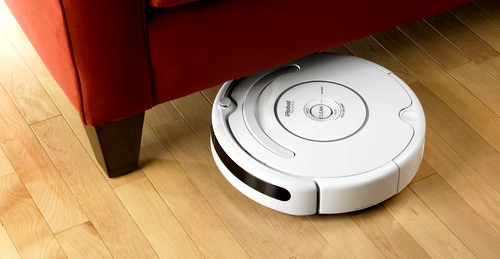 Roomba is on the way. Vacuum maker to design model for mowing lawns. Robotic vacuum manufacturer iRobot has been awarded the right to produce a model for mowing lawns. The company that makes the Roomba, a robotic vacuum cleaner, was granted permission by the FCC on Wednesday to develop a system sending frequencies from stakes located in the lawn to guide a mower, this according to a waiver filed at the FCC. The company had to file for approval since the stake system qualified as a fixed outdoor infrastructure, which is prohibited by the FCC. The system would use four to nine stakes, placed strategically in the yard, to control the robotic mower using certain frequencies. The waiver was opposed by the National Radio Astronomy Observatory, voicing concerns about interference on that frequency band. The group asked that measures be taken to avoid causing any harmful interference by the robotic mower to any radio astronomy service. The FCC responded to their concerns by saying the transmitters would be located less than two feet off the ground and that the potential of interference was greatly overestimated. The Bedford, Massachusetts company said the robotic mower can cut down on lawn mower emissions and noise pollution, as well as lowering the number of injuries and deaths related to the use of power mowers. They also say the mower can improve the quality of life related to residential lawn mowing, according to the waiver. The waiver was granted with the stipulation the device would only be permitted as a residential use product, and that the company will make it that clear to purchasers it can only be used for that purpose. It also stated the stakes emitting the frequencies must be no higher than 24 inches above the ground. Sounds like mowing the lawn might be a little more pleasant chore in the future. Teenagers everywhere are likely to embrace this new device.